It’s quite an eclectic place, and that makes Burton Gallery & Emporium in Clarkesville, Georgia, an even more delightful stop on a visit to the northeast Georgia Mountains! 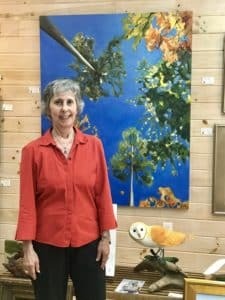 Owner Marlene next to a Patricia Fabian painting. The gallery—which Southern Living magazine tagged “one of the best galleries in the State”— does not take a narrow focus in its space. Instead Burton Gallery & Emporium displays a wide-ranging selection that will appeal to a variety of tastes. 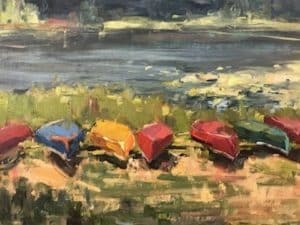 While it is known for a large collection of original paintings, these are just the tip of its artistic iceberg. Step inside and you’ll find a wealth of other interesting and intriguing inventory: handmade creations by local artists, folk pottery, paintings, jewelry, wood pieces, utilitarian pottery, hand-painted furniture, baskets, and other artsy items. A nice bonus, helpful staff will be happy to give you insights into some of the local artists whose work is on display. The shop offers an inviting, non-pressure environment, perfect for casual exploration. There is even a seating area next to a soothing Koi pond where visitors can take a break. Wednesday – Monday, 10:30 a.m. – 5:00 p.m. Closed Tuesdays. Burton Gallery is also a stop on one of the Scenic Drives we’ve written about on our website. The holidays are just around the corner, so why not plan a shopping weekend at Lucille’s Mountaintop Inn & Spa! We’re centrally located to super quaint mountain towns where you’ll find one-of-a-kind shops, like this one, filled with great gifts. Call today to make a reservation. Or book now online! Photos courtesy of Burton Gallery & Emporium. This entry was posted in Art, Georgia Bed and Breakfast, Georgia Mountains, Shopping and tagged Art, Folk Pottery, Georgia Bed and Breakfast, Mountain Crafts, North Georgia Day Spa, North Georgia Mountains, Shopping by admin. Bookmark the permalink.